This isn’t so much a race as a 12-car pile-up at the finish line. The season two finale is trying to do so many things at once, it skids helplessly out of control. There are moments here, in terms of both action and emotional beats, that should be on par with the first season finale, still this show’s finest hour to date. The need to wrap everything up and provide a big end-of-season set piece and a few big twists, along with enough convoluted Speed Force mythology to power a Crisis on Infinite Earths…it’s just too much for one episode to support. Some questionable choices have been made this season, regarding both tone and storytelling, but by the end of tonight’s episode, I was left with the sinking feeling that The Flash I loved has changed into something else entirely. In the plus column, at least the Zoom arc has been brought to a merciful conclusion. The notion that Zoom would want to settle everything by racing Barry to prove who is really the fastest man alive wouldn’t have been out of place in a Silver Age issue of The Flash; in fact, that sort of thing happened often. It just goes to show how far the TV show has strayed from that spirit that his plan seems so ridiculous here that there must be more to it. After all, Barry just watched this man kill his father in front of his eyes, so he’s not exactly going to be up for seeing who can get to the Eiffel Tower first. Wally still believes in the Flash, so he releases Barry from his cell and the race is on. In case it’s difficult to tell exactly what’s happening, Harry provides helpful commentary like “He wants to power up the Magnatar!” and “He’s powering up the Magnatar!” The writers must have been very unsure about this scene, because there’s a lot of that sort of handholding to explain how Barry has created a time remnant who sacrifices himself to power down the Multiverse-collapsing whatsit, allowing Barry to beat up Zoom until the time wraiths show up to destroy Zoom. It’s definitely a comic book-ish turn of events, but I’m not sure any resolution could have been truly satisfying given how disappointing the Zoom arc was overall. This leaves time for a couple more twists, the first of which couldn’t have come as much of a surprise to many of us. The man in the iron mask is indeed the real Jay Garrick, a speedster Zoom plucked from another universe, and he is Henry Allen’s doppelgänger. The second twist is much less expected and much more ill-advised: Barry time-travels back to the moment of his mother’s murder again, but this time he saves her. The previous Barry watches this happen and vanishes from existence. The timeline has been rewritten, but to what extent we can’t know yet. For now, it sure looks like this finale cheapens last year’s finale, along with all the lessons Barry learned (or thought he learned, anyway) since then. Maybe this is a way for the writers to hit the reset button and bring back the goofy Silver Age spirit of adventure that made the first season such a treat and has been present only sporadically this season. If that turns out to be the case, I’m all for it. I’d love a season three with no speedster Big Bad, one with room for the Rogues and Gorilla City, and maybe, finally, Mirror Master and Elongated Man. I hope that’s the case, but I fear this less fun, more brooding version of The Flash may be here to stay. To paraphrase Tina Turner, we don’t need another Arrow. 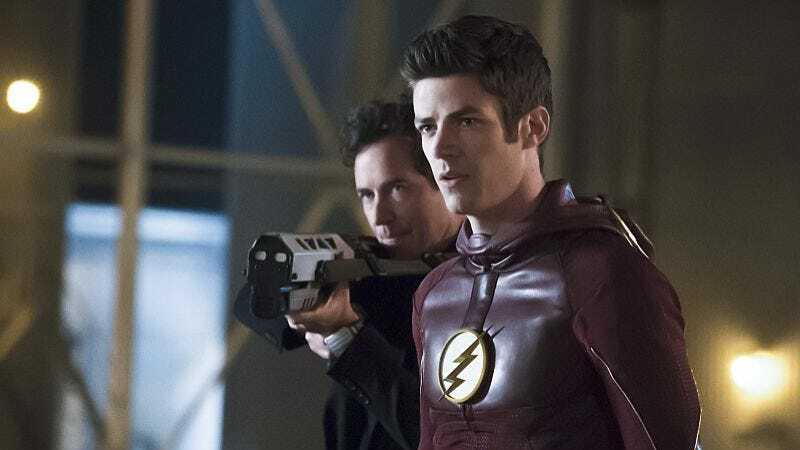 Harry accompanies Jesse and the real Jay back to Earth-2, raising questions about Tom Cavanagh’s future participation in the show. 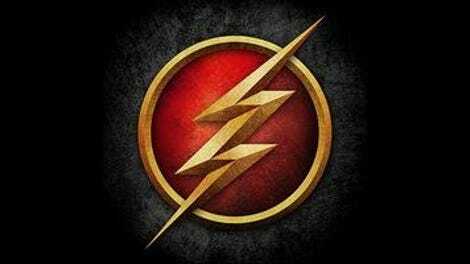 Will he become an occasional guest star, or will events early next season convince him to return to Team Flash? His goodbye scene was one of tonight’s most effective moments, but I’d really hate to see him go. So no Kid Flash and no Jesse Quick, even though the show appeared to present the ideal circumstances for this to happen when both Wally and Jesse were hit by the dark matter wave. Were they ever planned for this season? Did time just run out? Or did the creative team decide there were already too many speedsters in the mix? I’m glad there’s a real Golden Age Flash out there, and I’m glad it’s John Wesley Shipp. Even when the show was pushing toward the Barry/Iris relationship over the past few episodes, neither the characters nor the writers appeared ready to fully commit to the idea. So perhaps it’s appropriate that Barry basically tells Iris, “Maybe we’ll do this later?” They finally kissed and exchanged I love yous, at least. That may have to hold the shippers a while.